The South African government supports a mixed economy that combines an element of state intervention, ownership and regulation with private ownership and competition, President Zuma said delivering the annual ANC statement. Zuma called upon all South Africans to unite behind the national development plan (NDP), which sets out various measures to tackle unemployment, poverty and inequality. The recent ANC national conference has shunned calls to nationalise South African mines and other key sectors of the economy. The President underlined the importance of the state mining company, “Mining has historically been the backbone of our economy and should still contribute meaningfully to our development. 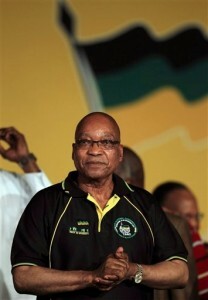 The ANC, Zuma said, would try to create a state mining company that will compete with the private sector. “We have also resolved that the state must capture an equitable share of mineral resources rents through the tax system and deploy them in the interests of long-term economic growth, development and transformation. Government must implement this resolution,” said Zuma. The South African President had said earlier this week.”Our goal is to achieve the appropriate balance of these elements to achieve the desired objective of social and economic development,” he told the Greek, Italian and Portuguese communities in Germiston. He was responding to a question on whether his administration preferred a free market or a “leftist type of economy”. “We must also recognise that South Africa’s inherited realities, the economic marginalisation of the majority, and high levels of inequality and poverty all create a particular need for an activist state,” he said. Zuma said his administration would streamline processes to help foreigners set up businesses, in a bid to boost foreign direct investment. “A one-stop shop to help potential foreign investors to set up business without undue delay is under consideration,” he said. He was accompanied by Finance Minister Pravin Gordhan, Trade and Industry Minister Rob Davies, among others.